Lift 1 sheet of rice paper out of the water, shake gently, then lay it carefully on a board. Place 2 prawns in the centre, with a mint leaf between them. Add a strip of avocado, pile some noodles on top, then add a layer of carrot and cucumber. 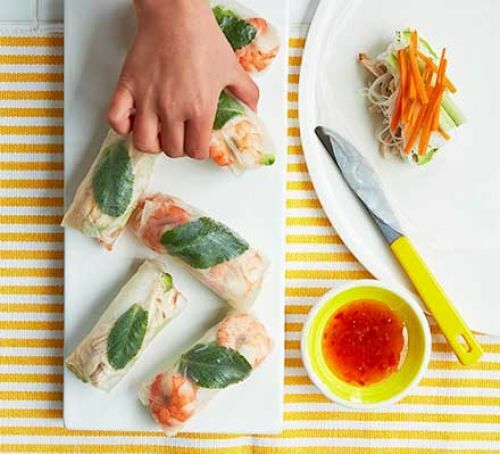 Fold the bottom half of the rice paper over, then fold the sides in and tightly roll it up. Repeat using the second wrapper and soak 2 more to make 2 more rolls.